Crime DOES pay, and thieves can prosper - Let's keep that in the sanctity of your brain, shall we? AKA the Purloined Plant Affair. In early autumn last year the house three doors south from me was vacant for a couple of weeks, after being sold. 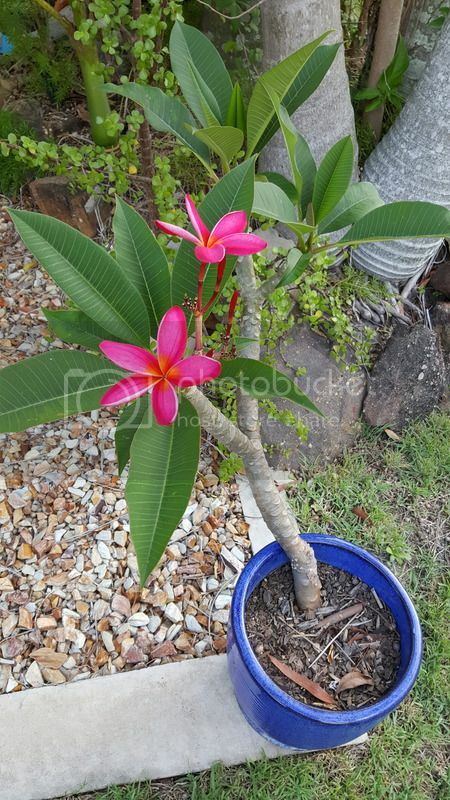 One thing I always admired about that house was a gorgeous frangipani tree that was covered in reddish-tinged flowers all summer long. I have a cream-flowered tree which has yet to flower, but I really wanted a red one as well. So late one night - or rather in the wee smalls of a Saturday morning, after at least a bottle of wine each - I mentioned to my sister how much I'd like a bit of this tree, and she being the Great Enabler said that we ought to do just that! So off we set, leaning on each other and cackling hysterically about the absurdity of what we were doing, and how, and when. Still laughing as I broke off a small branch, then sis fell over while trying to steady me, and scraped her knee something fierce. Homewards we limped, where I cleaned and bandaged her knee. Later (much later) that morning I stuck the branch into a pot of soil, and eventually it "took". And today I was rewarded. This is the picture I sent to my sister; I had to let her know that her scarred knee was not in vain. Heee! I have visions of your neighbours in hysterics behind curtains, too... *vbg* Pretty plant though! Isn't it just the prettiest thing! It was worth the adventure,to be sure. You and your sister are a pair of daft buggers! But what a prize. That is a healthy looking plant and I just love the colour. Always wanted a good pink one. I like your plan. It is a good plan. Just have to wait for the neighbours to move out again, and the house be vacant, and you're on! - or when mine gets big enough to break something off. It's only two foot tall at the moment, if that. But they grow, oh yes they do. It's already needing a bigger pot but I'm holding out for autumn before I repot it. I'm looking now for one of those apricot / orangey ones, hopefully will find one at Masters on sale.